Summary: An award-winning journalist delivers a chilling and unique thriller, in which a daring reporter's investigation into her sister's death draws her into the crosshairs of enemies determined to keep their secrets safe—at any cost. The United States and China have struck a shocking bargain: In return for forgiving trillions in debt, the People’s Republic of China—now the world’s dominant global superpower—has established a permanent military presence on US soil. Years of decline have left America economically vulnerable, and evidence of China’s cultural and political dominance is everywhere. 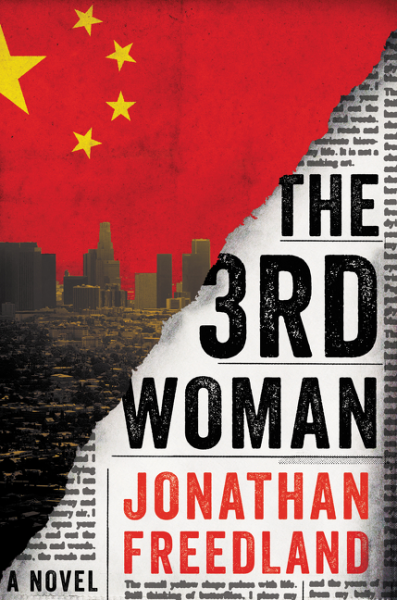 The setting for THE 3RD WOMAN by Jonathan Freedland is a time in the future when the United States is forced to allow China to have a military presence on the West Coast to insure the interest payments are made on the excessive Chinese debt. The Chinese presence also influences the United States culturally and politically. For example, movies must be approved by the Chinese government before release; sons of the Chinese ruling elite are active in the club scene and fill the pages of the gossip papers; Chinese sweat shops exist on the West Coast; the most popular club is named The Great Hall of the People; and the police and government leaders are influenced by the Chinese. The author also throws in smog masks, limited car usage and 3-D printers to complete the setting. Award winning LA Times journalist and insomniac Madison Webb learns that her sister is found dead in her apartment. She refuses to accept the police conclusion that the death is an isolated incident and begins her own investigation. Madison runs into roadblocks along the way from the police, the Chinese, her newspaper and even her family, but discovers that two other women, blonde like her sister, have also been found in nearly identical circumstances. With three similar murders identified, a serial killer may be on the loose. As Madison’s investigation comes together it suggests Chinese involvement. She is thrust in the spotlight, putting her life in danger as she exposes some powerful American and Chinese people. Madison Webb is the one major character in the book and her aggressive approach has her often acting more like a detective than a journalist. She is extremely intense in carrying out her investigation and at the same time very insensitive to the feelings of her family members who are mourning the sister’s death and to her own personal relationships. THE 3RD WOMAN is classified as a suspense thriller that has the mandatory twists and turns along the way. The ending will definitely surprise. Thanks to Booking Pap Pap for his review and thanks to the publisher for providing a review copy of this novel. That does sound suspenseful. I hope it never comes true!